Arkansas’ outdoor community is rallying to raise $80,000 for purchasing land that is key to piecing together the approximately 100-mile Buffalo River Trail (BRT). After years of pursuing this piece of private, wild land and exhausting options for alternative routes, activists have acquired an option to purchase and are working to raise funds by October. The price for the 64-acre parcel is $52,000. Buffalo River Foundation (BRF) needs $80,000 to buy the land, endow it for future care, and cover costs for the survey and appraisal said Ross Noland, head of the nonprofit BRF. The BRT is part of a trail system being assembled across the Ozark region that ultimately will span about 800 miles and connect Fort Smith, Arkansas to St. Louis, Mo. For more than a decade, the piece, known as the Roberts parcel for its owners, has been identified as a critical link to completing the Buffalo River Trail, but the Roberts haven’t been interested in selling. The section is mid river, near the South Maumee access. Completion will allow the 28-mile section between U.S. 65 and Arkansas 14 to finally be opened. Completion of the trail will increase tourism and be an economic boon for Searcy County, said Darryl Treat, president of the Greater Searcy County Chamber of Commerce. Another gap in the BRT exists between Pruitt and Woolum, but the park service owns that that section and is completing the trail. Most of the land hosting the trail is federally owned. The Roberts parcel was purchased in the 1960s by a family from Shreveport, La., and the land was intended to be used for fishing but passed after the grandfather’s death to his son, and is now owned by the three Roberts grandchildren, who have never visited the property. Duane Woltjen of the Ozark Highlands Trail Association praised Noland for finally cracking the code and convincing the family to allow an appraisal and accept a formal offer. Noland is an attorney in Little Rock. As head of the BRF, he primarily pursues conservation easements within the river’s watershed. He took particular interest in the dilemma of the Roberts tract after even Ken Smith, a legend in Buffalo River advocacy and trail building and author of the Buffalo River Handbook, couldn’t secure the family’s cooperation. “This is kind of like a small miracle and I give all the credit to Ross, as well as Ken Smith. Ross has delivered a performance that is exceptional,” Woltjen said. “The National Park Service did try hard over many years, but they were not going to get anywhere with this family,” Woltjen said. Smith said several years ago he traveled to Shreveport and unsuccessfully tried to negotiate with Bruce Roberts, one of the grandchildren. The Roberts used to own Buffalo River access, but during the 1970s the U.S. Park Service took the riparian zone through condemnation proceedings, Noland said. The park service wanted the entire parcel, but the family instead negotiated a conservation easement that prohibited timber harvesting or any home from being built on the land. An old logging road traverses the property that is ideal for the trail route, Woltjen said. Because the road is previously disturbed, requirements for archeological inspection for artifacts may be avoided, which would speed construction. Woltjen said a vision for the trail system began to form in the early 1970s, when a large meeting was held between Arkansas Game and Fish, the U.S. Forest Service, Corps of Engineers, Missouri Department of Natural Resources and Missouri Department of Conservation, the Ozark Highlands Trail Association, Ozark Society, some private landowners and supporters of the Buffalo River. 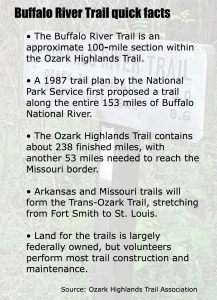 The parties determined a trail through the Ozarks was feasible and agreed upon the concept of what would later come to be known as the Trans-Ozark Trail. 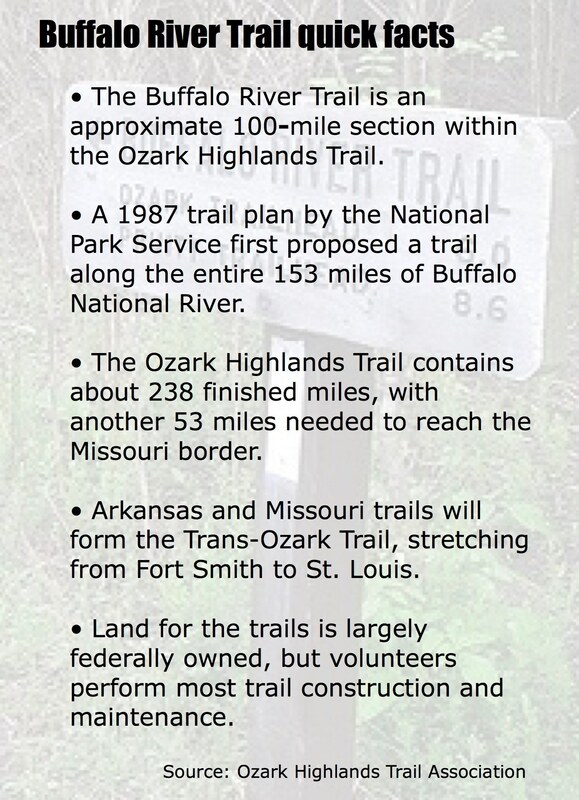 The National Park Service updated its trail plan to include the Buffalo River Trail in 1987 but recognized volunteer work and private funding would be essential. Trail crews were hired when money was available, but trails have been constructed and maintained largely by volunteers and under the supervision of Smith, who previously worked for the park service as a planner and civil engineer and has since been inducted into the Arkansas Tourism Hall of Fame. Smith said the park service still maintains an experienced trail foreman on staff, but has scarce other resources. That leaves much of the work for volunteers to perform, and more than 100,000 volunteer hours have built and maintained the Buffalo River Trail. Smith said he no longer builds trails but will support the project financially. “I’m not a wealthy man, but I’m extremely interested in a good outcome for the project and I will pay. Whatever you can give is what we need to get the job done,” was his message to the public. Noland said considerable interest in the purchase has been shown by residents in southern Missouri, as some populated regions in Missouri are closer to the Buffalo River than are Northwest Arkansas and Little Rock. As for who will ultimately retain ownership of the land, Noland said final disposition of the property would be up to the BRF board. “We’ll try to work a deal with the park, but the important thing is to get the property so the trail can pass,” Noland said.